This blog celebrates all the wonderful disabled folks thinking and writing about science fiction, fantasy and disability. We list some great resources at the end to help you delve deeper. Our next blog will be by Reclamation Press author Selene dePackh a fantastic writer of Neuropunk dystopian science fiction. 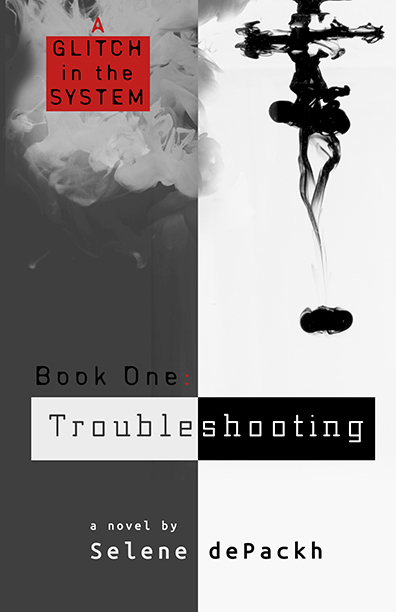 Her book Troubleshooting: Book One, Glitch in the System series will be available for sale in January 2018. Why do disabled people care about Science Fiction / Fantasy? It seems to be a natural reaction in the sterner type of critic to dismiss fantasy as escapism: But at times there is nothing so useful as escape, especially from a hospital bed. Do the SFF writers even imagine disabled people, particularly disabled young people, reading them? Are these writers who create enormously complex worlds, who build entire societies, so limited in their conceptions of human worthiness as to restrict the survivors of their worlds to only nondisabled people? “Infest the pens” – brilliant. Disabled writer Nicola Griffith notes: So much of the imaginary future is ‘perfect’ because crips don’t exist. The message is physical perfection = utopia. Yet she fought back by using SFF to reimagine illness from disability-empowered perspectives. Whenever there’s a call for disabled people to write SFF, the response is immediate and overwhelming: Twitter chat #CripLit: Science Fiction, Fantasy & Crip Futurism; the Deaf Poets Society’s Crips in Space; the Uncanny Magazine Disabled People Destroy Science Fiction; or the anthologies Accessing the Future and Disability in Science Fiction. no other literary genre comes close to articulating the anxieties and preoccupations of the present day as clearly and critically as SF, making it a vital source for understanding advances in technology and its impact on newly emerging embodiments and subjectivities, particularly for people with disabilities. Whether they #SayTheWord or not, there have always been stories about crips in space–and our presence in those stories underscores the underlying truth that d/Deafness and disability are and will always be a fundamental part of human existence. Disabled writers are creating exciting new work, demanding publishing space and challenging the existing paradigms of the stereotypical and eugenic roles assigned to disabled characters. opens up spaces to question/challenge/explore what it means to human, and, perhaps more importantly for this conversation, who gets to be counted as human. My own medical status has made it difficult to enjoy stories in which I would be annihilated pretty quickly, or else considered selfish for trying to survive. I envision if there was a zombie apocalypse, I’d be there, whacking zombies in the head with something and then zooming along in my wheelchair until my medicine runs out. There’d be no noble “save yourself!” from me unless necessary due to circumstance, and not because I would be a ‘burden.’ Instead, I’d strive to be a comfort and an ally to my friends and those around me, contributing to the whole as I do in my everyday life, right up until the end. Would that the fiction I consume had the same confidence in me as I try to have in myself. I am going to end with words from Kathryn Allan’s introduction to Accessing the Future, a collection of disability-perspective SFF writings. The stories and images of Accessing the Future are not here to pacify an audience who may be uncomfortable with disability, but to share disabled people’s stories of disability in all their wonder and sadness, hope and rage. We wanted stories of adventure and failure (because it’s the determination to act that matters); stories that scream with the passion and intensity of someone who knows what it is to suffer or face discrimination (but who refused to be made to disappear because it would be “better” for their condition to be “cured” in the future). These are stories that refuse to go gently.